As a long time Star Trek Fan, each new Star Trek movie is reason enough to do something special, like take a day off from work so I can enjoy the movie during a normal workday, without the large crowds of evening or weekend showings. And that is what I did for the latest outing from the Star Trek franchise, Star Trek Beyond. 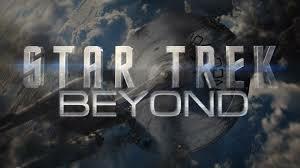 Like the previous movie, Star Trek into Darkness, the title made no sense and had nothing to do with the actual film. This is all part of the JJ Abrams school of secrecy that wants to keep as little information about the movie as possible from leaking out. If 1982’s Star Trek II: The Wrath of Khan, had been done by JJ Abrams, it would have simply been titled Star Trek Wrath. No spoilers on the villain! Of course Abrams had a lighter touch for this iteration of the film franchise (Justin Lin directed). He was only a producer, not a director for this one, which probably explains the paucity of lens flares. The rebooted Star Trek movies are action movies, so Justin Lin, of the Fast and Furious movies, makes an adequate director for that type of film. This irritates a lot of old school Star Trek fans, who don’t see Gene Roddenberry’s philosophical vision in the rebooted Star Trek films. However for me, that’s a feature, not a bug. Roddenberry’s “vision” was of a communist utopia that even in the realm of science fiction, made no sense. It was easier to make up the technobabble of transporters, holodecks, and faster than light travel then explain why they don’t need money and no one is drawing a paycheck, but still showing up for work every day. There is another reason of course. That kind of film just wouldn’t fly today. Mark Wolper, son of the man who brought Roots to life on the small screen in the 1970’s sat his 16 year old son down to watch the original Roots with disappointing results. His son just didn’t get it, it didn’t speak to him, and the production style was just too different. In other words, much of the movies and television shows that are considered classics now are basically unwatchable to millennials and younger. I got a taste of this myself when a few months ago I had a hankering to pull up a particular episode from Star Trek, TOS on Netflix. Although I enjoyed the episode and it was everything I remembered about it, it was also extremely slow moving, and slow paced compared to modern television and movies. Since I seldom dip back into decades old TV, it was eye-opening for me. If Star Trek is to survive, it has to be faster paced and more action packed than anything conceived of by Gene Roddenberry. And that’s what the new movie gets right. It’s a visually stunning picture with great special effects, fast moving, with great action sequences, and is finally starting to tap into some of the relationships that made Star Trek work in the first place. Karl Urban’s Doctor McCoy is pitch perfect and the movie highlights some of the old Spock-Bones rivalry that played so well on TOS and the original movies. Chris Pine seems more like Kirk and I would argue that the entire crew cast finally fits into their roles comfortably. If you knew nothing about Star Trek and were just looking for an outer space shoot-‘em-up while waiting for Rogue One to come out, this movie admirably fits the bill. If you are a Star Trek fan it might be a different story. In the tradition of JJ Abrams, it’s a great movie to watch, but as soon as you exit the theater and get hit with the harsh summer sunshine, you suddenly realize that the movie that you just watched and enjoyed made no sense. The first thing that made no sense to me was Starbase Yorktown. 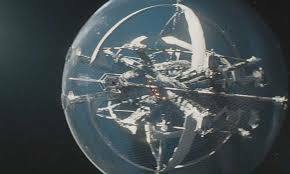 It just seemed illogical (with apologies to Mr. Spock) to me that 3 years into a 5 year mission to explore unexplored space, the Federation has a starbase as large as the Death Star on the frontier of known space. Visually it’s stunning, it’s like a giant moon sized snow globe, but it also looks ridiculous; something that no one would build regardless of how much money and technology they had. If you can build something like that, why bother with planets? But the silliness of the design of a star base isn’t a large plot point. Having a ridiculous villain is, and Idris Elba’s character Krall is a ridiculous villain. The alien Krall looks like he put super glue all over his face and dived headfirst into a box of gravel, but the worst part is that Krall isn’t an alien at all; he’s really a human, from an early Federation starship. I told you this was going to be spoilery. So this early starship, the USS Franklin, crash lands on this planet with an abandoned alien mining facility, and yada yada yada, the Captain, Balthazar Edison is transformed into some sort of long lived, energy draining rock face who has a totally inexplicable reason for hating the Federation and decides to use the mining facility as a launching pad to prepare an attack against the Federation. Again, his motivations are pretty unclear except for some vague Nietzsche-like desire to purge the Federation of weakness. Idris Elba is totally wasted in this role. Any buff guy who can handle rock make up could have pulled it off. The USS Franklin is it’s own level of ridiculousness, since even though Krall/Edison was the captain of that ship and crashed on that planet, he somehow managed to forget all about it so thoroughly that one of his escapees Jaylah used it as a refuge and was slowly working to repair it. Jaylah, played by Sofia Boutella, actually was one of the more interesting characters and had such a good chemistry with Scotty that I wouldn’t mind if she joined the crew for the next movie. However could she have done such a good job that Chekov could make the more than a century old ship space worthy in a few hours? It just doesn’t make sense. Although I had a lot of high hopes when I heard that Simon Pegg was writing the script, I came away underwhelmed. Parts of the movie seemed like they were patched on from other movies. Like in 2009’s Star Trek, this movie made heavy use of the Beastie Boys Sabotage. Now kudos for discovering how good Sabotage is for an action scene, and the battle scene with Sabotage playing is actually kind of cool, but we had already seen that used in a Star Trek movie. They seriously couldn’t find another piece of music that would work? Nor was I happy that they destroyed the Enterprise again. Somehow, that ship had managed to last the entire original series up till Star Trek III: The Search for Spock. Now, barely into the 5 year mission and the ship is already toast. Even some of the destruction scenes seemed like retreads. Didn’t I see that same saucer section crash scene in Star Trek Generations? The Enterprise’s destruction in previous movies was because they were simply out of ideas, but if they are already out of ideas on the third movie into a rebooted franchise, what’s the point? Once you destroy the ship that is as much of a cast member as any of the actors, you lose the ability to keep the crew together in any way that makes sense. If you think this might be your last movie, than go for it, but since there is already a commitment for a fourth movie, why make script writing more difficult for yourself for the next movie? The movie ends with a montage of the new Enterprise being assembled. After building a moon sized Star Base, I imagine a starship is child’s play. My only surprise was that they didn’t play Eye of the Tiger during the rapid fire scenes of the new Enterprise’s assembly, interspersed with shots of Kirk and the crew working out in the snow. Given the limited amount of imagination and originality allotted to this film, I won’t be on the edge of my seat awaiting Star Trek 4: The Revenge of Ivan Drago, or whatever “villain” they determine they need to make the movie work. So it’s a credit to the people who bring us such movie magic that they actually put together an enjoyable film from such a weak script. But however disappointed I am in a limited story, they have a chance to make it up to me in January with the new Star Trek TV show, Star Trek Discovery. Don’t disappoint me, even though I’ll watch it anyway. Man of Steel Leaps to a Justice League Movie? Although I was a fan of Superman comics since childhood, I had no great love for Richard Donner’s Superman movies. It was not a fan boy disdain for a movie that wasn’t an exact copy of the comics, but that the 1978 Superman The Movie just didn’t live up to the hype. Mario Puzo, writer of The Godfather, wrote the story for both Superman and Superman II, so for me, the expectations were pretty high. Instead, I got a story in which at the end of the film, Superman goes back in time and fixes everything. That’s functionally no different than the character waking up to discover it was all a dream. To me, that has to be one of the worst endings for a major motion picture. No matter what they paid Mario Puzo for that, it was too much. So I didn’t have exceptionally high expectations for Man of Steel. I suppose that’s the best way to go into a movie since I ended up enjoying it without bringing my Mario Puzo baggage into the theater. It was Superman recast as more of a Science Fiction movie. Superman who grew up not knowing his origins and who he was, and a Superman who (spoiler alert –bail now if you haven’t seen the movie) actually goes too far and kills his nemesis, General Zod. Although Man of Steel was no Avengers or Star Trek, it was on a tier just below that; a good retelling of the origin and a good possible springboard for future movies involving superheroes from the DC Universe including a Justice League movie. Warner would love to capture the magic that The Avengers has brought. I just don’t think it’s possible to replicate that with the DC Universe. There are too many differences that would prevent that. For one thing, the known characters are lame. With the exception of Batman, most of the DC characters that Warner has to pull from their grab bag just would not be interesting on film. Wonder Woman is a character that has been attempted for movie and film for years, including a series developed for this fall, and one planned for last fall and they just couldn’t make it work. It’s hard to take a character inspired from Greek mythology and fit it into the same Science Fiction Universe that Man of Steel has created. The Martian Manhunter is so powerful as to be almost god-like, and would look ridiculous outside of an animated treatment. Green Lantern, although it didn’t exactly bomb, failed to generate any excitement and it would be hard to argue that character deserved another shot (although The Hulk got exactly that kind of makeover for Avengers). It’s possible though. There are multiple Green Lanterns to choose from. If Hal Jordan doesn’t work, there is also John Stewart, Guy Gardiner, and Kyle Rayner. One of them is bound to work. And then there is Aquaman. Less said about him the better. Although it’s just in the rumor stage, it’s possible that Warner may try to pull a reverse Avengers and do a Justice League movie first then spin out stand alone movies from there. That would be an exceedingly bad idea in my opinion. None of the Marvel characters used in the Avengers were really that well known (with the exception of the Hulk). They had name recognition, but no knowledge of the characters and no reason for the movie going public to have an interest in them until that interest was created by the stand alone movies. Those stand alone movies made the appearance of characters like Captain America, The Hulk, Thor, and Iron Man appearing in a single movie an event. Marvel walked before it ran, and that’s what DC needs to do. How, you may ask? If it were up to me, I would make the Man of Steel sequel a Superman/Batman movie. Since Batman has to be recreated and reimagined anyway, why not make the next movie one in which the Batman character is introduced as living in the same movie Universe as Superman? Given the popularity of Batman, if you can’t draw fantastic box office numbers with a movie that has both Superman and Batman, there is no point doing a Justice League movie. Creatively I think it would make for a great movie. In the comics, Batman was often able to get the upper hand on his super powered buddies by thinking several steps ahead. Superman plays checkers, Batman plays chess. Naturally enough, a super powered being would tend to rely on those same super powers as a solution to any problem, but in a world of super powered people, how does a normal human compete? With his mind of course. Just an idea, and if it doesn’t work, Superman can always go back in time to fix everything. I went to see this movie the first weekend it was out but I held off on posting this to avoid violating any sort of unwritten rule on spoilers, but at this point, enough time has passed that knowing that the character Benedict Cumberbatch plays is Khan is either already well known, or totally irrelevant. If you’re not familiar with the Star Trek Universe and are just interested in an action movie in space, whether the villain is named Khan or John Harrison is hardly a spoiler to anything important to the movie. If you are a long time Trek fan, the fact that the villain is named Khan is… frankly it’s not a spoiler either way. Unlike Star Trek II: The Wrath of Khan, the villain’s real identity isn’t really important to the plot of this movie, and he could really just been named John Harrison without really adding or subtracting from the story. Khan’s identity is more of an Easter egg than a spoiler for this movie. But that’s fine if JJ Abrams secrecy on this point seems a little overdone. That is part of how Abrams markets his movies. I liked the Easter eggs in this movie and makes me feel as though the people who made the movie really care about the source material, and they are winking, just to me, that “Hey, we really get Star Trek!” Even though Abrams probably didn’t know the difference between Star Trek and Star Wars before he took over the project. As movies go, it was a thoroughly entertaining film, and it both answered some old questions and raised some new ones in the new Star Trek universe. One of the things that had bugged me from Abrams first Star Trek film was how quickly Kirk went from cadet in trouble to Captain of a starship. Really? Even if you save the world, I’m thinking that Starfleet still doesn’t want to give a relative newbie the command of one of its top of the line starships. How do you skip all of those ranks anyway? Surely there are some Starfleet regulations having to do with time in service. In this movie, that’s rectified by how quickly Kirk loses his rank and position when he’s caught violating the Prime Directive. Kirk, busted down to First Officer, held the rank of Commander. So just extrapolating here, but that leads me to believe that Captain was only a brevet rank, meaning he was assigned to the rank of Captain based solely on his position as skipper of the Enterprise, not as a rank he had actually earned and been promoted into. So Commander was probably Kirk’s permanent rank. Still, that’s not bad for someone who skipped most of the junior officer rank structure. The other thing that I had an issue with was what was up with the white Khan? Don’t get me wrong, I think Benedict Cumberbatch did a fantastic job playing the villain and really upped the ante on the level of acting in this movie, but he’s a man without a trace of melanin in his system, and he was cast to play Khan Noonien Singh, an Indian character. I understand that in 1960’s Hollywood, you probably wouldn’t even think of casting an actual Indian to play an Indian. They went with a Latin actor, Ricardo Montalbán instead. Montalbán turned out to be an inspired choice. He had not only the acting chops, but the sort of command presence that’s required to successfully play someone who was a deposed leader. And boy, did the ladies love him! Check out this clip from the original series Star Trek when he turns on the Alpha game on one of Kirk’s crewbabes. That’s total Alpha Game, but fair warning; don’t try this at home kids. It goes without saying that Montalbán steals every scene in 1982’s Star Trek II: The Wrath of Khan. When JJ Abrams was looking to cast his new Khan, once again he was looking at Latin actors. Casting a Latin to play Indian in 1967 may have made perfect sense, but why would you do that in the 21st Century? There are plenty of actual Indian actors who could have played that role. But instead, the actor who wins the role is the whitest person from an island whose populace is already known for being pasty faced. I’m not the only one who noticed this, the folks at Racebending.com made a big deal about it as well. So how does this fit into the overall Star Trek alternate timeline? Based on 2009’s Star Trek, JJ Abrams made his divergent timeline from Kirk’s birth, so every event from that point on was up to be changed or altered. But Khan was from the 20th Century. He preceded the divergent timeline and should have still been an Indian actor with a Mexican accent, rather than an Indian character with a British accent (I know, an Indian character with a British accent makes more sense). If you allow me to geek out a bit, a couple of possibilities present themselves. It’s possible that the Original Series Kirk altered the timeline. The episode Space Seed, established the character Khan, his origins as a genetically engineered superman, and his role in the Eugenics Wars, which took place from 1992 to 1996. Remember the war years? Good times… Within the three seasons that comprise the Original Series, the crew of the Enterprise was involved in time travel incidents that could have altered Earth history on at least three occasions: Assignment Earth, taking place in 1968, The City on the Edge of Forever, which has Dr McCoy drastically altering events in depression era San Francisco, and Tomorrow is Yesterday, taking place in 1969. Although all of these incursions were “fixed,” they were fixed via the band-aid approach. Except in the episode Tomorrow is Yesterday, they didn’t undo the original timeline alteration; they merely made other changes to repair the original changes. With that method, who knows what differences in the time line seeped through that were not obvious initially? It’s also possible that the Temporal Cold War, from the Enterprise TV series could have altered 20th Century events. In the two part Enterprise episode Storm Front, aliens from the future drastically alter the 20th Century by providing assistance to the Nazi’s so that they win World War II. By the end of the episode, the timeline has been “reset” and things are back to where they are supposed to be, although what exactly that is seems unclear. The Eugenics Wars and Khan could have all been reset as well. Just so I’m clear, one of the changes that I’m discussing is whatever DNA that was used to create Khan in the first place may have been altered. Khan was genetically engineered after all, so different timelines could mean different strands of DNA could have been selected to create Khan. In other words, the genetic material could have come from a different Cumber-batch of DNA. How about, a whiter shade of Khan? Anyway… by the time the crew of the Voyager get their opportunity to mess with 20th Century Earth, in the episode Future’s End, the Voyager crew wind up in 1996, supposedly the last year of the Eugenics Wars. However everything seemed… much like our 1996. No major world wars featuring genetically engineered supermen. Nor did the Voyager crew seemed to be expecting a Eugenics War. Maybe it had been shifted or eliminated from the timeline? My guess (and really, this is all nothing but guesses) is that the Eugenics Wars did happen, only not in the 1990’s as they did from Khan’s original timeline. They probably happened some decades later, but they still happened, since the Eugenics Wars were still an issue during the time period of the Enterprise TV show. This is the type of trivia that only a nerd could love, but it’s important. That’s why JJ Abrams pulled the alternate timeline trick rather than just do a re-imagining of the series like was done with Battlestar Galactica. Doing a hard reboot of the series and ignoring what came before would have been the easiest path, but it would drive Trekkers crazy. Who needs that? Has Star Trek’s Khan Noonien Singh been “whitewashed”?